Chinese archaeologists had always believed that Chinese culture slowly expanded from a point along the Yellow River. This belief was put into question when two massive sacrificial pits were discovered during a dig near the quiet Chinese village of Sanxingdui, which is situated in the Sichuan province of China. The discovery of these pits has turned the archaeological world on its head. In 1929, a farmer digging a new well discovered a stash of jade relics, which led Chinese archaeologists to excavate the area around the village. Nothing came of these explorations until 1986, when two enormous sacrificial pits were found. Uncovered from the pits were thousands of pottery, jade, bronze, and gold artifacts that were not seen elsewhere in China before. This exciting find led to a whole new understanding of the development of Chinese culture. The artifacts were dated as being 3,000 to 5,000 years old, and archaeologists knew they were examining a previously unknown ancient culture that had developed thousands of miles from civilizations of a similar age. The artifacts showed evidence of having been burned or broken before they were carefully buried; however, this doesn’t detract from the magnificence of the find. The dig uncovered sculptures with animal faces, masks with dragon features, human-style heads with masks on, figurines of animals such as dragons, birds, and snakes all beautifully decorated, as well as a sacrificial altar, a bronze tree, rings, knives, and other decorative items. 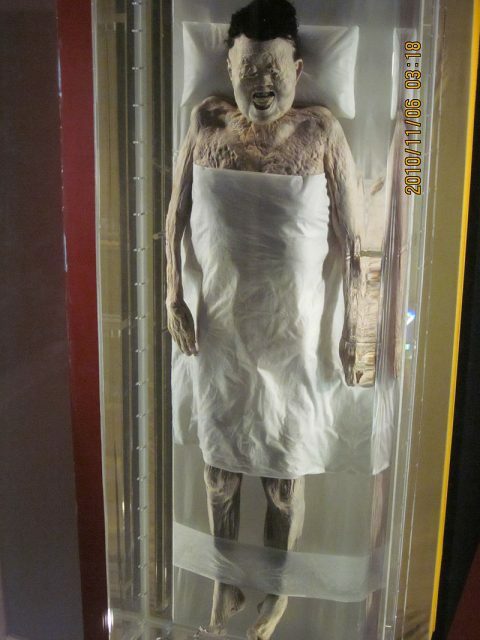 The most unusual item found was an eight-foot-tall human figure made of bronze. 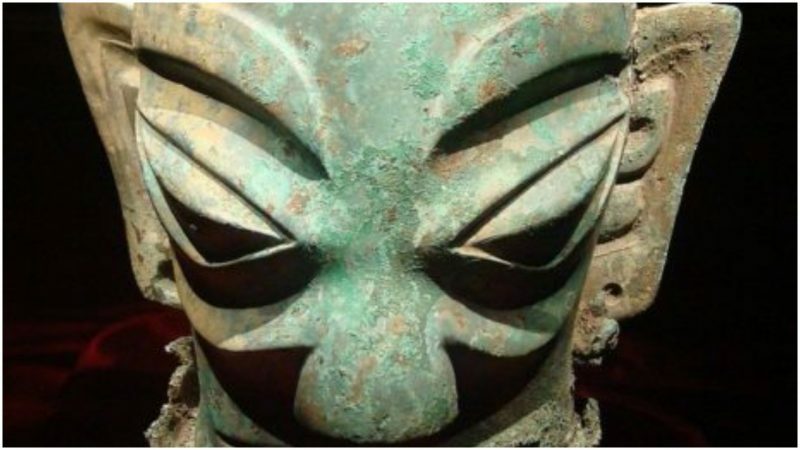 The archaeologists were surprised to find numerous bronze masks and human heads that have square faces, huge almond-shaped eyes, long straight noses, and exaggerated ears. These were carbon dated and found to be from the 12th to 11th century BC, and the well developed technology used to create these bronzes astounded the scientists. The ancient Chinese metallurgists knew that adding lead to an amalgam of copper and tin gave them a stronger substance that they could use to create large items such as the human and the tree. One of the masks, the largest ever found anywhere, measured an astounding 1.32 meters wide and 0.72 meters tall. The animal-like ears, protruding eyes, and ornate bodies of these masks demonstrated an artistic style unique from any other found in China. Unfortunately, no written texts have been located at Sanxingdui to help scientists unravel the mysteries of the city. 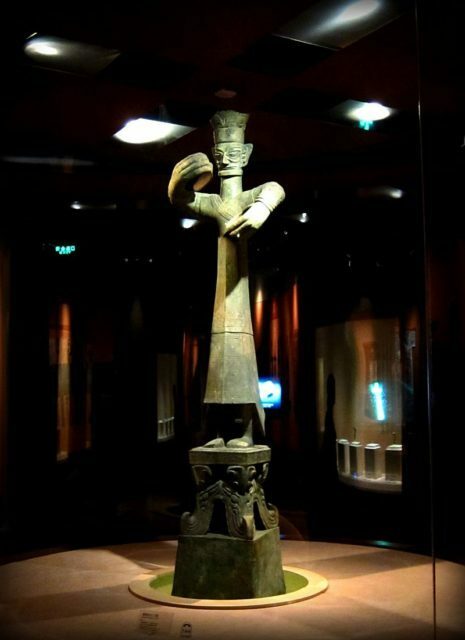 This Bronze Age civilization, which is now known as the Sanxingdui Culture, has been associated with the ancient kingdom of Shu; the rich artifacts have been attributed to the legendary kings of Shu. There may be few reliable records that link this civilization to the kingdom of Shu, but the Chronicles of Huayang that were written in the Jin Dynasty, which existed from 265-420 AD, tell of the Shu Kingdom being founded by the Cancong. 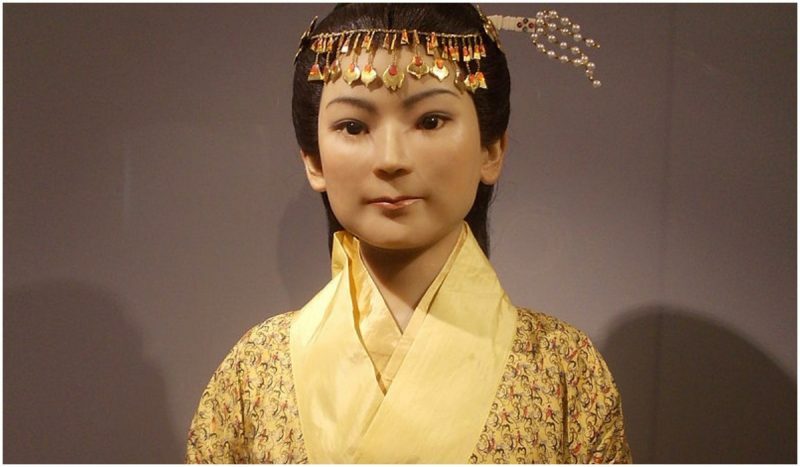 These people were described as having bulging eyes, a common feature of the artifacts found at Sanxingdui. The unearthing of these magnificent items caused a major stir in archaeological circles and will fuel research for many years to come. The use of camouflage to hide oneself from an opposing person or force is nothing new. Since time immemorial, people have taken cues from the natural world and used concealment methods and tactics to hide their position and movement. However, this has evolved into being more than face paint, fabric, and tree branches, and some methods are quite innovative. Green or drab uniforms replaced the previous red or blue versions in the 18th century, and the regular use of camouflage in military units was born. This soon included equipment, buildings, and even aircraft and ships. 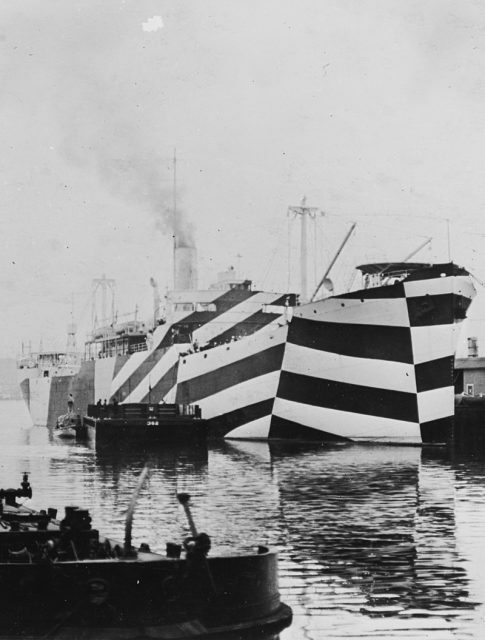 “Dazzle” paint schemes were used on ships during the First and Second world wars. While the literally dazzling pattern didn’t make the ships disappear altogether (that would be a feat! 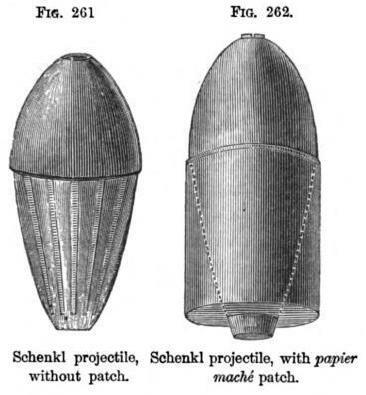 ), it did make them appear smaller, therefore harder to hit. This pattern even inspired the Chelsea Arts Club “Dazzle Ball” in the UK in 1919. During the world wars, both sides often fabricated tree stumps out of wire and papier maché to hide themselves from snipers and observers. They were designed to look like other trees on no-man’s land–battle damaged and stripped bare. However, because they had to be placed in flat, exposed areas, the replacement of real trees with fake versions was dangerous work. One such tree is on display at the Australian War Memorial, in Canberra, and it is signed by a soldier, Private Frederick Augustus Peck, who was killed three months after he signed his name. It has not only been green and leafy areas that required the use of camouflage. 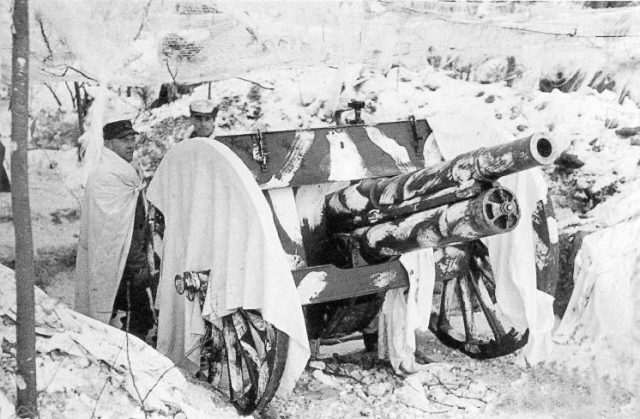 During the First and Second World wars, forces fighting in the colder regions of the world used winter camouflage. While one may think that it would only need to be white, it often included some green and black, taking its cues from winter plumage and fur of arctic animals. Forces deployed in northern areas today still use arctic camouflage on a regular basis. Even animals have been camouflaged. English troops fighting in Egypt during World War I sometimes painted their horses as zebras, making them almost invisible in the tropical foliage. This may have inadvertently had other advantages. In recent years, it has been claimed that a zebra’s stripes make it less attractive to pesky, and disease-carrying, horseflies–an added bonus when you’re in the tropics. Camouflage was mostly used on guns and equipment during World War I, and, like today, each country had its own pattern. 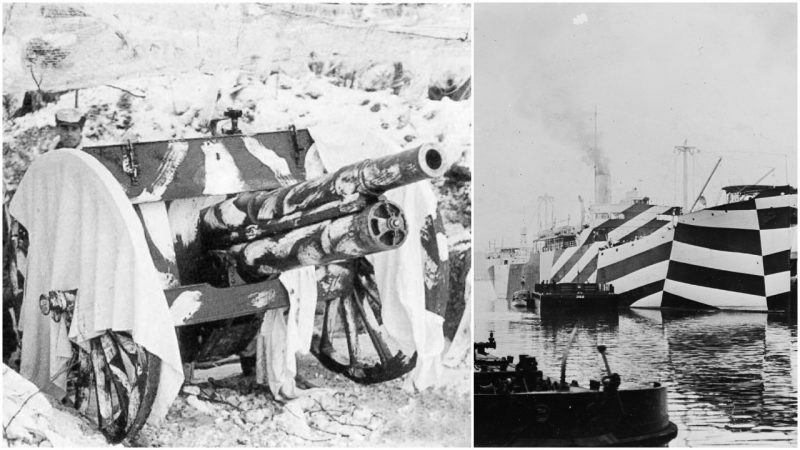 However, sometimes it was necessary to deceive the enemy with visible decoys – perhaps the opposite of camouflage. This was done by using mannequins, dummies, and cutouts. 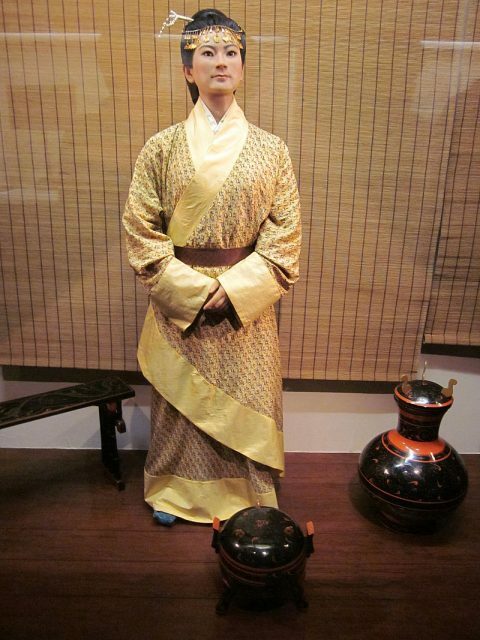 There is recorded evidence that mannequins were used by the ancient Chinese during the Battle of Yongqui. Scarecrows were lowered along the castle walls to draw enemy arrow fire. 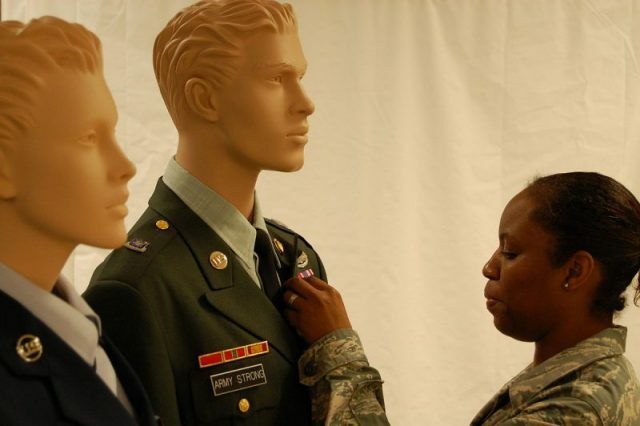 Mannequins were also used to draw sniper fire away from soldiers in World War I trenches. Any sniper firing at one of these fake soldiers would give away his own position, making him vulnerable. Likewise, Finnish forces are known to have used mannequins in a similar way during the Winter War (part of World War II). The figures would, like the World War I versions, draw sniper fire, and allowed the Finns to return fire upon the Soviet soldiers. One highly unusual piece of camouflaged equipment, a Land Rover used by the British SAS during World War II, was painted a dusky pink. Its curious color was perfect for the African desert where it was used, especially in the early morning and at dusk. Today, military forces are still using and developing methods of concealment, from special paint to pixelated camouflage, and more. In the future, “invisibility” clothing may be used. Perhaps J. K. Rowling was on to something. Cultural Revolution, in full Great Proletarian Cultural Revolution, Chinese (Pinyin) Wuchanjieji Wenhua Dagemingor (Wade-Giles romanization) Wu-ch’an Chieh-chi Wen-hua Ta Ke-ming, upheaval launched by Chinese Communist PartyChairman Mao Zedong during his last decade in power (1966–76) to renew the spirit of the Chinese Revolution. Fearing that China would develop along the lines of the Soviet model and concerned about his own place in history, Mao threw China’s cities into turmoil in a monumental effort to reverse the historic processes underway. During the early 1960s, tensions with the Soviet Unionconvinced Mao that the Russian Revolution had gone astray, which in turn made him fear that China would follow the same path. Programs carried out by his colleagues to bring China out of the economic depression caused by the Great Leap Forwardmade Mao doubt their revolutionary commitment and also resent his own diminished role. He especially feared urban social stratification in a society as traditionally elitist as China. Mao thus ultimately adopted four goals for the Cultural Revolution: to replace his designated successors with leaders more faithful to his current thinking; to rectify the Chinese Communist Party; to provide China’s youths with a revolutionary experience; and to achieve some specific policy changes so as to make the educational, health care, and cultural systems less elitist. He initially pursued these goals through a massive mobilization of the country’s urban youths. They were organized into groups called the Red Guards, and Mao ordered the party and the army not to suppress the movement.Mao also put together a coalition of associates to help him carry out the Cultural Revolution. His wife, Jiang Qing, brought in a group of radical intellectuals to rule the cultural realm. Defense Minister Lin Biao made certain that the military remained Maoist. Mao’s longtime assistant, Chen Boda, worked with security men Kang Sheng and Wang Dongxing to carry out Mao’s directives concerning ideology and security. Premier Zhou Enlai played an essential role in keeping the country running, even during periods of extraordinary chaos. Yet there were conflicts among these associates, and the history of the Cultural Revolution reflects these conflicts almost as much as it reflects Mao’s own initiatives. Mao’s concerns about “bourgeois” infiltrators in his party and government—those not sharing his vision of communism—were outlined in a Chinese Communist Party Central Committee document issued on May 16, 1966; this is considered by many historians to be the start of the Cultural Revolution, although Mao did not formally launch the Cultural Revolution until August 1966, at the Eleventh Plenum of the Eighth Central Committee. He shut down China’s schools, and during the following months he encouraged Red Guards to attack all traditional values and “bourgeois” things and to test party officials by publicly criticizing them. Mao believed that this measure would be beneficial both for the young people and for the party cadres that they attacked. The movement quickly escalated; many elderly people and intellectuals not only were verbally attacked but were physically abused. Many died. The Red Guards splintered into zealous rival factions, each purporting to be the true representative of Maoist thought. Mao’s own personality cult, encouraged so as to provide momentum to the movement, assumed religious proportions. The resulting anarchy, terror, and paralysis completely disrupted the urban economy. Industrial production for 1968 dipped 12 percent below that of 1966. During the earliest part of the Red Guard phase, key Politburo leaders were removed from power—most notably President Liu Shaoqi, Mao’s designated successor until that time, and Party General Secretary Deng Xiaoping. In January 1967 the movement began to produce the actual overthrow of provincial party committees and the first attempts to construct new political bodies to replace them. In February 1967 many remaining top party leaders called for a halt to the Cultural Revolution, but Mao and his more radical partisans prevailed, and the movement escalated yet again. Indeed, by the summer of 1967, disorder was widespread; large armed clashes between factions of Red Guards were occurring throughout urban China. During 1967 Mao called on the army under Lin Biao to step in on behalf of the Red Guards. Instead of producing unified support for the radical youths, this political-military action resulted in more divisions within the military. The tensions inherent in the situation surfaced vividly when Chen Zaidao, a military commander in the city of Wuhan during the summer of 1967, arrested two key radical party leaders. In 1968, after the country had been subject to several cycles of radicalism alternating with relative moderation, Mao decided to rebuild the Communist Party to gain greater control. The military dispatched officers and soldiers to take over schools, factories, and government agencies. The army simultaneously forced millions of urban Red Guards to move to the rural hinterland to live, thus scattering their forces and bringing some order to the cities. This particular action reflected Mao’s disillusionment with the Red Guards because of their inability to overcome their factional differences. Mao’s efforts to end the chaos were given added impetus by the Soviet invasion of Czechoslovakia in August 1968, which greatly heightened China’s sense of insecurity. Two months later, the Twelfth Plenum of the Eighth Central Committee met to call for the convening of a party congress and the rebuilding of the party apparatus. From that point, the issue of who would inherit political power as the Cultural Revolution wound down became the central question of Chinese politics. When the Ninth Party Congress convened in April 1969, Defense Minister Lin Biao was officially designated as Mao’s successor, and the military tightened its grip on the entire society. Both the Party Central Committee and the revamped Communist Party were dominated by military men. Lin took advantage of Sino-Soviet border clashes in the spring of 1969 to declare martial law and further used his position to rid himself of some potential rivals to the succession. Several leaders who had been purged during 1966–68 died under the martial law regimen of 1969, and many others suffered severely during this period. Lin quickly encountered opposition. Mao himself was wary of a successor who seemed to want to assume power too quickly, and he began to maneuver against Lin. Premier Zhou Enlaijoined forces with Mao in this effort, as possibly did Mao’s wife Jiang Qing. Mao’s assistant Chen Boda, however, decided to support Lin’s cause. Thus, despite many measures taken in 1970–71 to return order and normalcy to Chinese society, increasingly severe strains were splitting the top ranks of leadership. These strains first surfaced at a party plenum in the summer of 1970. Shortly thereafter Mao began a campaign to criticize Chen Boda as a warning to Lin. Chen disappeared from public view in August 1970. Matters came to a head in September 1971 when Lin himself was killed in what the Chinese asserted was an attempt to flee to the Soviet Union after an abortive assassination plot against Mao. Virtually the entire Chinese high military command was purged in the weeks following Lin’s death. Lin’s demise had a profoundly disillusioning effect on many people who had supported Mao during the Cultural Revolution. Lin had been the high priest of the Mao cult, and millions had gone through tortuous struggles to elevate this chosen successor to power and throw out his “revisionist” challengers. They had in this quest attacked and tortured respected teachers, abused elderly citizens, humiliated old revolutionaries, and, in many cases, battled former friends in bloody confrontations. The sordid details of Lin’s purported assassination plot and subsequent flight cast all this in the light of traditional, unprincipled power struggles, and vast numbers of Chinese people began to feel that they simply had been manipulated for personal political purposes. Initially, Premier Zhou Enlai benefited the most from Lin’s death, and from late 1971 through mid-1973 Zhou tried to nudge China back toward stability. He encouraged a revival of the educational system and brought back into office a number of people who had been cast out. China began again to increase its trade and other links with the outside world, and the economy continued the forward momentum that had begun to build in 1969. Mao personally approved these general moves but remained wary lest they call into question the basic value of having launched the Cultural Revolution in the first place. During 1972, however, Mao suffered a serious stroke, and Zhou learned that he had a fatal malignancy. These events highlighted the continued uncertainty over the succession. In early 1973 Zhou and Mao brought back to power Deng Xiaoping. Zhou hoped to groom him to be Mao’s successor. Deng, however, had been the second most important purge victim at the hands of the radicals during the Cultural Revolution. His reemergence made Jiang Qing and her followers desperate to firmly establish a more radical path. From mid-1973 until Mao’s death in September 1976, Chinese politics shifted back and forth between Jiang Qing and those who supported her (notably Wang Hongwen, Zhang Chunqiao, and Yao Wenyuan, who with Jiang Qing were later dubbed the Gang of Four), and the Zhou-Deng group. The former favoured ideology, political mobilization, class struggle, anti-intellectualism, egalitarianism, and xenophobia, while the latter promoted economic growth, stability, educational progress, and a pragmatic foreign policy. Mao tried unsuccessfully to maintain a balance between these two forces while he struggled to find a successor who would embody his preferred combination of each. From mid-1973 until mid-1974 the radicals were ascendant; they whipped up a campaign that used criticism of Lin Biao and of Confucius as a thinly veiled vehicle for attacking Zhou and his policies. By July 1974, however, the resulting economic decline and increasing chaos made Mao shift back toward Zhou and Deng. With Zhou hospitalized, Deng assumed increasing power from the summer of 1974 through the late fall of 1975, when the radicals finally convinced Mao that Deng’s policies would lead eventually to a repudiation of the Cultural Revolution and of Mao himself. Mao then sanctioned criticism of these policies by means of wall posters (dazibao), which had become a favoured method of propaganda for the radicals. Zhou died in January 1976, and Deng was formally purged (with Mao’s backing) in April. Only Mao’s death in September and the purge of the Gang of Four by a coalition of political, police, and military leaders in October 1976 paved the way for Deng’s subsequent reemergence in 1977. Although the Cultural Revolution largely bypassed the vast majority of the people who lived in rural areas, it had serious consequences for China as a whole. In the short run, of course, the political instability and the constant shifts in economic policy produced slower economic growth and a decline in the capacity of the government to deliver goods and services. Officials at all levels of the political system learned that future shifts in policy would jeopardize those who had aggressively implemented previous policy. The result was bureaucratictimidity. In addition, with the death of Mao and the end of the Cultural Revolution (the Cultural Revolution was officially ended by the Eleventh Party Congress in August 1977, but it in fact concluded with Mao’s death and the purge of the Gang of Four in the fall of 1976), nearly three million party members and countless wrongfully purged citizens awaited reinstatement. Bold measures were taken in the late 1970s to confront these immediate problems, but the Cultural Revolution left a legacy that continued to trouble China. There existed, for example, a severe generation gap; individuals who experienced the Cultural Revolution while in their teens and early twenties were denied an education and taught to redress grievances by taking to the streets. Post-Cultural Revolution policies—which stressed education and initiativeover radical revolutionary fervour—left little room for these millions of people to have productive careers. Indeed, the fundamental damage to all aspects of the educational system itself took several decades to repair. Another serious problem was the corruption within the party and government. Both the fears engendered by the Cultural Revolution and the scarcity of goods that accompanied it forced people to fall back on traditional personal relationships and on bribery and other forms of persuasion to accomplish their goals. Concomitantly, the Cultural Revolution brought about general disillusionment with the party leadership and the system itself as millions of urban Chinese witnessed the obvious power plays that took place under the name of political principle in the early and mid-1970s. The post-Mao repudiation of both the objectives and the consequences of the Cultural Revolution made many people turn away from politics altogether. Among the people themselves, there remained bitter factionalism, as those who opposed each other during the Cultural Revolution often shared the same work unit and would do so for their entire careers. Perhaps never before in human history has a political leader unleashed such massive forces against the system that he created. The resulting damage to that system was profound, and the goals that Mao sought to achieve ultimately remained elusive. 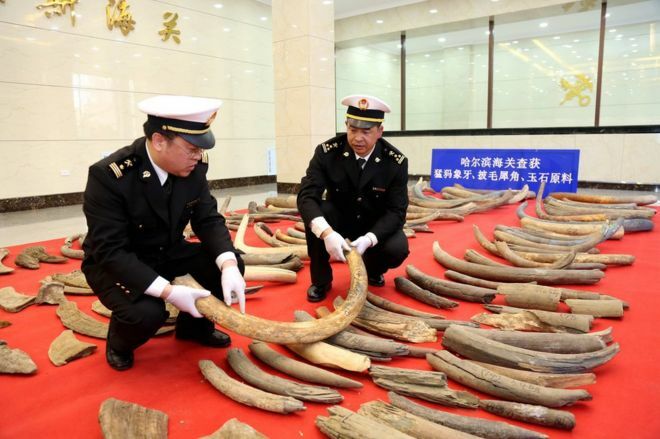 Chinese customs officers have seized more than a tonne of tusks from animals that have been extinct for thousands of years – mammoths. State media are reporting that the massive haul came from Russia and was seized in north-east China in February. 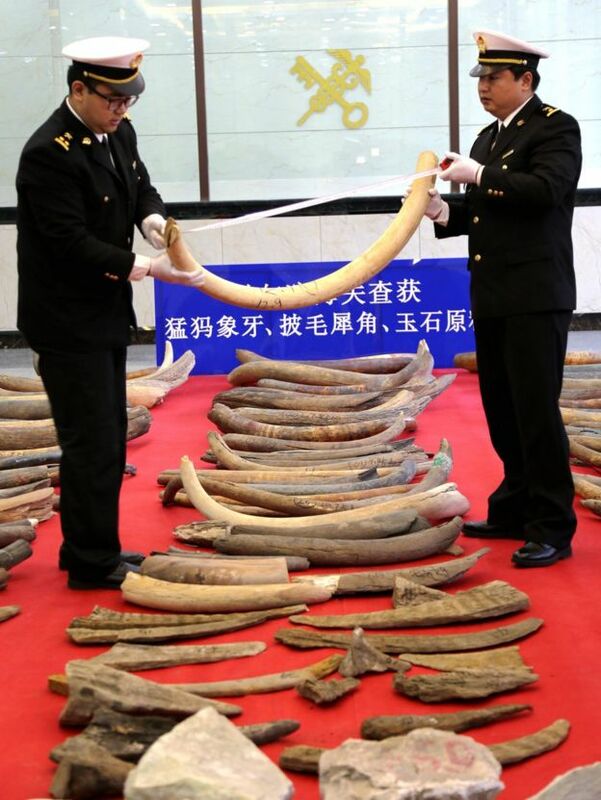 The largest piece of mammoth ivory seized was more than 1.6m (5ft) long, a customs officer was quoted as saying. There is no international ban on the trade but Chinese officials said the haul was not declared. The stockpile is part of a booming trade between Russia and China in ivory taken from the skeletons of mammoths found in the Siberian tundra. The effects of global warming in the Arctic has made it easier to collect tusks preserved in ice for thousands of years, researchers say. More than 100 woolly mammoth tusks were seized at the port of Luobei in Heilongjiang province, in addition to 37 woolly rhino horn parts and more than a tonne of jade. They were hidden in concealed compartments in a truck, according to reports. The truck driver is alleged to have claimed he was only carrying soybeans, and to have fled the scene when the truck was inspected. He and another person were later arrested. 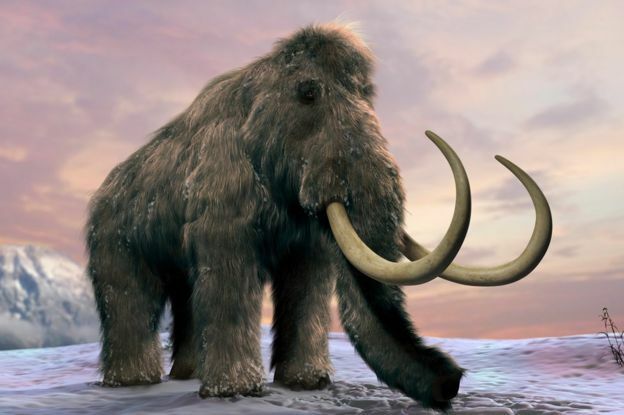 There are estimated to be around 10 million mammoths that “remain incarcerated within the permafrost of the Arctic tundra”, according to Douglas MacMillan, a professor of conservation and applied resource economics at the University of Kent. Some mammoth experts have suggested that the trade in mammoth ivory should be banned, even though the animals are extinct. They argue that their tusks are often sold as elephant tusks, and thus encourage overall demand for ivory. It is estimated that more than 50% of the ivory sold into China, which has has the biggest ivory market in the world, is mammoth ivory. Hong Kong is a major destination, and the ivory is used to make jewellery and other objects, including ornamental tusks. But other experts like Prof MacMillan say that a ban would not halt the trade but rather “drive it underground and attract the attention of organised crime groups”. 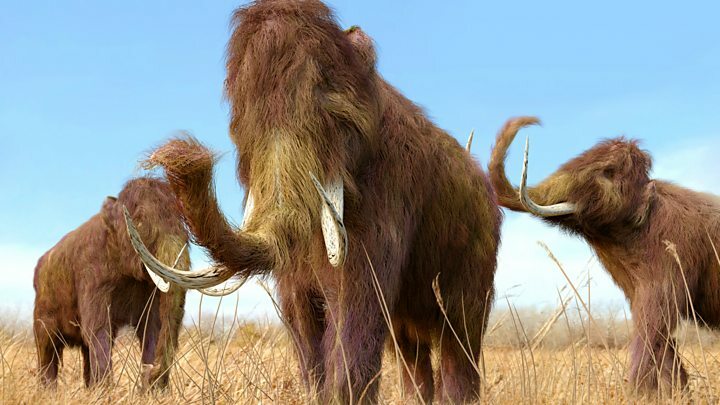 Most of the world’s woolly mammoths had died out by about 10,500 years ago. Scientists believe that human hunting and environmental changes played a role in their extinction. China has announced a ban on all elephant ivory trade and processing activities by the end of 2017. Human beings around the world delight in fiery foods. Thai, Mexican, Chinese, Indian, Ethiopian – the cuisines that can take the roof off your mouth are numerous and flavourful. Ranking the world’s most spicy peppers and comparing the most awe-inducing dishes is a common pastime, even if, past a certain point, the distinctions are somewhat moot. Who can say, subjectively speaking, that one Indian restaurant’s Widower Phaal, made while wearing goggles with chilis that rank about 1,000,000 on the Scoville Scale – an international measurement of pungency – is necessarily a fierier experience than the notorious Korean Suicide Burrito? There’s plenty of burn to go around: more common dishes include vindaloo with ghost peppers and hot pot from Sichuan, where you must part a swarm of chillis bobbing in a sea of broth to fish out tender, fiery morsels of meats and vegetables. As you savour these intense tastes, however, you may wonder, why do some cuisines compete for the title of spicy champion, while others feature barely the hint of a burn? This is a question that has intrigued anthropologists and food historians for some time. Indeed, it’s a curious truth that places with warm climates do seem to have a heavier preponderance of hot and spicy dishes. That may have something to do with the fact that some spices have antimicrobial properties, studies have found. In one survey of cookbooks from around the world, researchers note: “As mean annual temperatures (an indicator of relative spoilage rates of unrefrigerated foods) increased, the proportion of recipes containing spices, number of spices per recipe, total number of spices used, and use of the most potent antibacterial spices all increased.” In hot places, where before refrigeration food would have gone off very quickly, spices might have helped things keep a bit longer – or at least rendered them more palatable. It’s also been suggested that because spicy food makes most people sweat, it might help us to cool off in hot parts of the world. The evaporative cooling effect that happens when we perspire is indeed useful in maintaining a body’s heat balance. In a very humid climate, though, it doesn’t matter how much you sweat: that evaporation won’t come to your rescue because there’s already too much moisture in the air. One study of people who drank hot water after exercise showed that they did cool down slightly more than those who drank cold water, but only in situations with low humidity. Thailand in August, that ain’t. But spice is hardly limited to the tropics. While chilli peppers are originally from the Americas, this particular kind of heat grew widespread in the 15th and 16th Centuries, travelling with European traders. Other spices – not spicy in the same way as peppers, perhaps, but still strongly flavoured and bringing an extra oomph to a dish – had been circulating in Europe for centuries, with ginger, black pepper, and cinnamon brought in from the east. Heavily spiced dishes were the darlings of many cuisines we currently don’t think of for their zing. Numerous recipes in one 18th-Century British cookery book include potent doses of mace, cloves, and nutmeg, for instance. What happened? Well, one possibility is that it became a bit uncouth to like quite so many flavours in one’s food, as Maanvi Singh has written over at The Salt. What we now consider classic European cuisine has a tendency to focus on pairing like flavours with like, rather than bringing in a riot of strong, contrasting ones. That may be because, as spice prices plummeted in Europe in the 1600s and it became easier for just anyone to lace their food with them, tastemakers fell out of love with them. Shifting the goalposts for high-end food, they began to emphasise dishes where the focus was the purest essence of the basic ingredients, combined with flavours that served to bring that out. In a word – it may have been snobbery, Singh writes, that erased the thrill of spice from many European palates. Indeed, the role of human culture in determining whether spice is hot or not cannot be underestimated. Like all animals, we use taste as a way to determine what’s safe to eat, and once we get used to certain flavors signalling the familiar, we like them all the more. It would not be surprising if some people, having acclimated to chillis, began to prefer them over the absence of chillis. Today, we have our own reasons for eating spicy foods, and they may have more to do with adrenaline than social status or sheer flavour, per se. The physiological reaction to peppers, as we’ve discussed here before, is the result of temperature sensors in the mouth being activated. Your body responds as if you had burned it, causing you to sweat and flush, and in extreme cases vomit. The thrill of triggering this intense experience without (usually) any long-term effects is thought to be part of the attraction – as well as, for some chilli fiends, the bragging rights. Antimicrobial qualities and body temperature regulation are probably not on the list of possible draws today – something to ponder, and thank your lucky stars for, as you wait for your next curry.